Hello! I’m Kelly Bahmer-Brouse — “Bahmer” is pronounced with a long ‘a’: “BAY-mer”; “Brouse” rhymes with “house.” I was born the year the Beatles came to America in the town where Pepsi-Cola was invented — but I’ve lived almost all my life in the Best Location in the Nation. It’s where I still live, with my husband Andy and our cat Archie. Andy and Archie make frequent cameos in my artwork. Back in 1983, (was was then called) the Tribune Company Syndicate named me one of the 10 best college cartoonists in America. Now I draw, paint, and illustrate whatever happens to be on my mind. 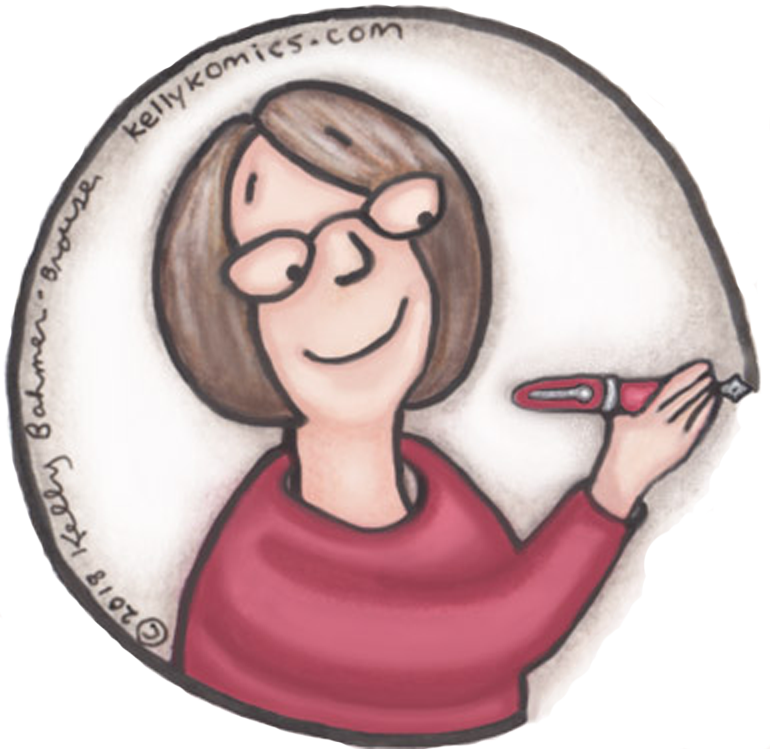 You can keep up with my latest artwork in a couple of ways: WordPress offers the option of subscribing to my latest blog posts via email, and KellyKomics also has its own Facebook page. I’m on Tumblr as well. A lot of my work is available on a wide variety of products –shirts, mugs, posters, &c.– via my Zazzle store and my Cafe Press store. If you don’t see what you want, let me know! …and tailored to the recipient’s interests! If you’d like me to create something for you or someone you care about, drop me a line: kellykomics < at > earthlink < dot > net.